I haven't heard from Eli for a couple of months now, she certainly has her hands full with this problem and I do feel sorry for her. I'm sure she will eventually provide us with absolutely beautiful dolls. I got my Moonglass girl today, she is absolutely exquisite. Poor Eli went through so much work addressing the issues and making them perfect, and I must say the effort was absolutely worth it. The doll does feel just like porcelain and her coloring is do beautiful. Sorry I haven't figured out how to post a pic yet, and also sorry for taking a photo at night with fairly bad lighting- but I fid want to share! thank you for your flickr link to your most gorgeous Moonglass girl! Her finish appears so smooth in your photos. It is a treat to see your owner's photo! (nice wig on her also) - congratulations on your new Marmite Sue! galacticat, your girl is beautiful, I love the look of the Moonglass. Oh she does look very nice! How does she compare to the resin doll when it comes to posing? What happened was that because they are mixing the material themselves, they wore out their equipment, which released flecks of metal into the slip, it wasn't until the first set of dolls had already been fired that the flecks showed up, and they were evidently everywhere so she had to start over completely. But really, I did not expect the dolls to be fast, I can't think of any artist commission of this level of complexity that did not end up taking significantly longer than the artist had hoped/estimated. I am just very very glad that she didn't give up! I can't wait to see what she comes up with next! I really shouldn't share photos that I took at night- it really doesn't do her justice, the color on the Moonglass is really quite amazing. I will say she poses like porcelain, and is not quite as easy to pose as the resin, but I do love that the Moonglass will never yellow the way resin inevitably will. I can't wait to order another! She looks great! All three of them do, what a great collection! Thanks! I absolutely love my Marmite Sue dolls- her skill is absolutely amazing, and I am very drawn to her beautiful surreal aesthetic. I never get tired of looking at her dolls. Even more amazing is that despite such incredible skill, she is such an amazingly kind humble person. Did anyone else get their dolls yet? Did anyone by chance order both Moonglass and Shell? I am very keen to know the difference between the two. galacticat, congratulations on your Doll. Too bad i can't see her pictures anymore, but i believe you that she is wonderful. I am waiting on my doll in Shell, but she expected much later this year. Thank you for your mail and for your kind patience. The good news is that your doll is already cast and fired, and i'm painting her now. However the larger dolls are taking the most time because they demanded a larger amount of clay that was being mixed by hand, and I can fit only one at a time in the kiln, while the painting takes many firings. 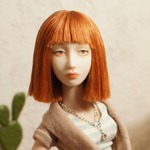 I`m making your doll as beautiful as possible, so please understand if it takes a month or two longer.. I know everyone is waiting, i'm, trying my best, I have not taken any holidays. She really is so sweet- and yes, Eli's dolls are well worth the wait. The level of detail and care she puts into each one is truly amazing. Sorry about the photos- they must have disappeared when I trimmed them. Here is my lovely angel- I promise to get better photos soon! Galacticat, your doll is wonderful. Hope to seamer pictures of her. Marina, are you waiting on the bigger doll? I hope she will be done soon, so we can see her when she arrives to you. Poor Eli, she is working really hard to complete the order from last year. I am also waiting for a doll ( the second pre-order ). So i don't know when she'll be done. Did anyone contacted Eli? I hope that she was not affected by the earthquakes. I emailed to het today, but heard nothing yet. I got an email a few months ago in which Eli told about her problems with the first batch of dolls. She was doing her best to catch with her orders. No news since then. I have two orders: the first is the same as Galacticat's and the second is Alice. However I don't mind the wait as I know Eli will deliver the best quality possible.